Menpa Namgyal Qusar is a teacher, researcher and an established clinical practitioner of Tibetan Medicine. He has graduated from Dharamsala Men-tsee-khang College in 1987 with Kachupa Degree (equivalent to MBBS) and then with Menrampa Degree (equivalent to MD) in 1997. 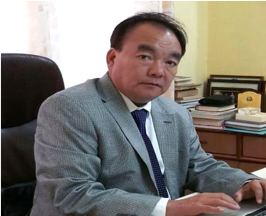 He started his career as a Researcher at Research and Development Department of Men tsee-khang in 1987 and later held the post of Deputy Director of Research & Development Department, Men-tsee-khang until 1999. He has been a visiting professor of Tibetan medicine at Norbulingka Academy of Tibetan Culture, Dharamsala since 2001 and the Founder Director of Qusar Tibetan Healing Centre, P.O.Sidhpur, Dharamsala (H.P.) From 2004-2006, he worked as a general secretary and registrar of the Central Council of Tibetan Medicine, Dharamsala. During his work in Men-tsee-khang, Menpa Namgyal Qusar pioneered in the development of several Sorig Health Products for Men-tsee-khang and designed several Tibetan medicine clinical research projects and designed a Tibetan Medicine Clinical Trial Protocol on newly diagnosed Non-Insulin Dependent Diabetes Mellitus for the Research and Development Department, Dharamsala (H.P.) in 1988-89. He also contributed on Research Paper on Weight reduction in patients with coronary artery disease: Comparison of Traditional Tibetan Medicine and Western diet, that was published in International Journal of Cardiology in 2013. He was a project coordinator of Tibetan-Austrian joint research project on Tibetan Medicinal Plants in1994-95. Menpa Namgyal Qusar has widely travelled to more than 19 countries for Seminars, Workshops and Conferences. He is also one of the key resource persons on Tibetan Medicine Training and Courses to Tibetan Medicine Physicians. He was also invited to speak at the International Conference on Tibetan Medicine, held at Harvard Medical School in October 2017. Menpa Namgyal Qusar is a recipient of Gold Medal from Board of Alternative Medicine, Calcutta in 1997 and an Outstanding Award from Men-tsee-khang, Dharamsala on 24 March 2016.